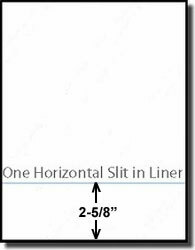 Full Page Rectangular Labels 8.5" x 11" With HORIZONTAL liner cuts! These Weatherproof Labels are most often used for Outdoor Signs - Temporary or Permanent Signs. Print your own Garage Sale or Yard Sale Signs. Mount them on Plastic, Metal, or other Weather Proof Backing, and they will look new for YEARS! The product is as advertised. The quantity was enough for a small project. The price was affordable! The service was fine, but the main attraction is the product itself. I had been using glossy paper labels for my custom electronics products, but they were easily damaged by contact with water. These vinyl labels stick better, are easy to cut, and are not susceptible to damage. Placed my first order with Label Outfitters recently, and unfortunately our order never turned up. I contacted customer service to let them know, and they very promptly and courteously apologized for the delay and re-sent the lost item to us at lightning speed. The product itself looks and feels like it will be perfect for our needs. Will be using this site again. Thanks. I love the feel and texture of the labels. I used them to do some bumper sticker and they turned out great. I will order some more soon.